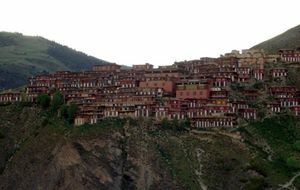 Dzongsar Monastery (Tib. རྫོང་གསར་དགོན་པ་, dzong sar gönpa, Wyl. rdzong gsar dgon pa) — a Sakya monastery in Derge which was the main seat of Jamyang Khyentse Wangpo and Jamyang Khyentse Chökyi Lodrö. The other main incarnations at Dzongsar were the Gongna and Ngari tulkus. 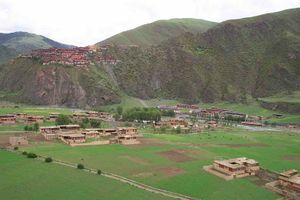 Dzongsar Tibetan Buddhist Monastery was founded by Chögyal Pakpa on his return from China in 1275. Before this it had been a Nyingmapa and a Kadampa temple, and originally was the site of a Bönpo shrine. Before 1958, Dzongsar had between 300 and 500 monks, but the whole surrounding area would be filled with tents whenever Jamyang Khyentse Wangpo or Jamyang Khyentse Chökyi Lodrö were in residence, with people camping for days or even weeks in the hope of gaining an audience with these great masters. All the temples were destroyed in 1958, but rebuilding began in 1983 under the guidance of Dr. Lodrö Puntsok. This page was last edited on 6 March 2018, at 22:40.